Let’s Bring the $2.00 Bill Back!! When it comes to cash, I’m an equal opportunity owner. I have $10 bills, $5 bills, $20 bills, and of course many many $1.00 bills. So today’s goal for this post is quite simple: to get you to start using the $2.00 bill! I don’t care if you use it just once or a thousand times. I want these puppies circulating so fast that McDonald’s comes out with a $2.00 Item Menu! ;) The only rule is that you do it THIS WEEK – deal? Oh I can’t use these because politicians used them to bribe votes! No honey, I was not with that prostitute charging $2.00/trick. Yes, I did go to the race tracks to gamble, but I swear – I did NOT place any standard $2 bets! So why do I care so much about these long lost bills? Because they bring SO MUCH JOY to people! The side effect of no one ever using them is that people get so intrigued by them, and in return get intrigued by YOU. A nice little side effect. And they’d be correct. They ARE special. Because you could have given them any ol’ bill like the thousands of schleps before you, but you didn’t. You gave them something memorable and something they haven’t ever/rarely seen before. And guess what? Now you become memorable to them too! Score! Okay okay, I get it Jay. Where the hell do I get these $2.00 bills? And what are some ways I can avoid being such a schlep? First off, it’s easier for you to get your hands on these than it is for our president to get off Twitter. Just visit any local bank of yours and tell the nice person behind the window you’d like a stack of $2.00 bills please. Then bingo-bango, they’re all yours! (But don’t forget to pay for them first, or you’ll be trying to impress a whole other set of people for the next 20 years). #1. Tip someone with it! Its value is literally only $2.00, but it gives off the impression of being worth much more. And if you cherish quicker/better service, this is one surefire way of accomplishing that too. #2. Give one to that hottie you’re trying to woo. Having trouble with the ladies calling you back? I guarantee they won’t throw away your number written on a $2.00 bill ;) And if your skills really are that bad, hey – who knows who will get that bill next? #3. Give it out as stocking stuffers/birthday gifts! No matter what people say, they do NOT hate getting $$$$ as gifts. Have you ever seen anyone give money back? Secondly, $2.00 bills aren’t like real money anyways as we’ve now come to know, so it doesn’t actually count. And since again people think they’re worth so much more than they are, you get to spend less and still come off as a hero! #5. “Accidentally” leave one on the floor of your office and see how many thieves work with you entertain yourself for a few minutes. Film it, and maybe you’ll get rich when it goes viral! Remember, this is a mission you cannot refuse, so feel free to use me as an excuse if you find yourself in a precarious spot. I much prefer letters of adoration though, so please – use your 2 (dollar) cents. Once you’ve used a $2.00 bill this week, come back here and tell us what you did so we can all ooh and ahhh over it. And if you do end up pulling off a date outta this, I get dibs on naming your first child together! J. Dinero kinda has a nice ring to it, doesn’t it? Two Dollar McDonald’s Menu here we come!! I’m definitely guilty of hoarding my $2 bills. It’s just so rare and not commonly seen in the public. The same for the $50 bills, are they even still in circulation? The part where you can go to the bank and ask for $2 bills seem like a cool trick! I’ll probably use it and give it out as tips to see how mind blown people would get when they see it. Also – ask your sister to watch out for old $100s, $500s, and $1,000 bills for me please!! Wow, that is a long time ago I’ve seen one of those! Been to the states may times, but only have seen one once before. Do bring them back indeed! I was actually standing in line at the bank a few weeks ago I’m pretty sure one of the guys in front of me was getting a couple hundred dollars in $2 bills. From what I could gather, he had to call ahead because a person from the back came out & said they were ready. The teller had started giving him $20 bills from her drawer thinking that’s what he meant to say. I have one or two $2 bills and it’s something I want to give to the Tooth Fairy in a few years. Along with the old Susan B. Anthony silver dollars or the 50-cent Kennedy pieces. Prices have a way of creeping upward by as it is. It’s only a matter of time before all the $1 menus have turned to $2 menus, I don’t think they need our help getting there faster ;). I have to admit that I’m guilty as charged of being a $2 bill hoarder. I didn’t realize that they were still being printed or that you could just ask for them at a bank like that so I’ve prized the few that I’ve come across. But from now on I’m going to be asking for $2 bills every time I go to the bank for cash. My Grandpa used to give us all a stack of $2 bills on our birthday. You do get some pretty awesome reactions when you pull those bad boys out. Your grandpa is my new favorite person. I have a $2 bill that I keep for luck. I’m not sure where I got the idea that they’re lucky (maybe because they’re rare) but I believe it, therefore I keep it. I suppose if I spend it, I’m spreading the luck. But I like having it. It’s almost like a luck security blanket. We had some 2$ bills in the past but now they made it a 2$ coin here. I am a little bit too to have used the 2$ bills, but I would love to have bills over coins. Coins are more difficult to transport for an everyday usage so it go in the saving jar. Probably easier to spend as a coin vs bill too, eh? Like doesn’t seem like as much money? The tooth fairy is leaving $2 now? Man when I was a kid it I was lucky to get a quarter! I do enjoy getting a $2 every now and then and I also love the confused look on cashiers faces when you pay with them too! We’re trying to do our part, but the bank doesn’t always have them these days. The 2 spot is fun to put into cards as a gift supplement. I was also a big fan of the Sacagawea dollar — I used to exchange for rolls of them before the weekend came. I loved buying beers with “spare change.” Made it seem like a smaller line item than it really was. Ecuador uses US currency and Sacagawea dollar coins are very popular there. I always seem to have several with me when I return from those trips. But I’ve given up trying to spend them in the US. Too many cashiers have simply refused to believe they are real US coins, let alone worth a dollar. I get an special envelope every year from a coworker with a $2 bill in it for the Chinese new year. They call it lucky Money. You are supposed to spend it and it is supposed to bring you luck. I still have quite a few two dollar bills I was given as a kid. Them and Kennedy half dollars. Neither are particularly rare but you see them so rarely they still bring a smile to my face. My coin collecting is no where near what someone would call a collection, but I do have some older stuff hanging around as well. 2 dollar bills were the non rare gateway drug. Being a dad of twins I’ve always been a fan of the $2.00 for obviously reasons. I have a few sitting on my dresser. Funny two dollar bill story. I was in a fast food place one day and the guy in front of me trying paying with one. The young cashier obviously had never seen a two dollar bill, thought it was fake, and said it couldn’t accept it. The guy had the cashier call his manager over to verify that in fact the two dollar bill was real. Isn’t the goal to be post-cash? “post” as in “over” cash? like never use it? Oh man, I haven’t seen a $2 bill in years. Next time I go to the bank, I’ll definitely ask for a stack. Oh yeah! I would much rather receive a $2 bill tip than $5 in singles because they’re so mysterious. Cool idea, def will get these babies back in action. Watch out America! Hahaha, but these are adorable ideas. I’ve had a few $2 in my lifetime. Each time I’ve spent them, it’s started an interesting conversation. 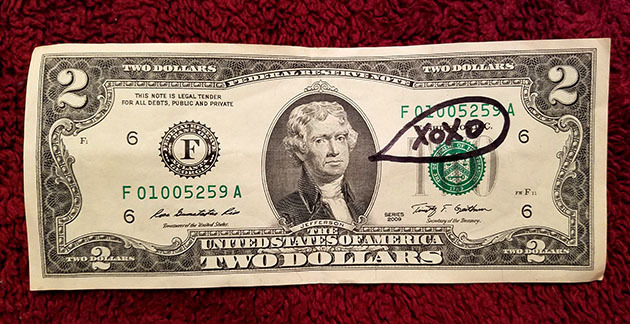 So yeah, if you’re trying to flirt with that barista, a $2 bill might be a good way to grab their attention! It would be a huge headache if this really caught on. Fast food/gas stations would have to change out the registers. The current registers only have five slots- 4 for bills and 1 for coins (plus a menagerie of small coin pockets). When I was working at McD’s, we had to put bills greater than $20 behind the 20s. I only got three $2 bills ever. When I waited tables and tended bar, I got a few $2 bills for tips, one with a number… I spent it unceremoniously on some gas for my car. Last story- A few weeks ago, I heard someone say, “Phony as a two dollar bill.” I wanted to correct them, but I didn’t care quite enough. Well you’re not helping the cause today! We took our 5 year old son to see Dead & Company this summer. While we were hanging out waiting for the concert to start, a guy walks up to my son and hands him a crisp new $2 bill, tells him “keep it” and walks away. My son was super excited since he had never seen a $2 bill before! And it did bring him good luck – he got to hear a 20 minute version of his favorite song! We made a framed collage of various souvenirs and things we were given from his first ever Dead show (because apparently people like to give stuff to little kids at concerts) and included the bill. I wonder how often that guy hands out $2 bills? Does he only give them to kids? Does he only do it at Dead shows? It was definitely a cool experience for us! Sometimes I add them to the pinata goodies. Or in a very country game of spreading out a bale of hay and throwing all sorts of coins in it for the kids to dig around and find. Adding 2 or 3 of those along with $1 coins and it ups the joy by a factor of 10. I think I still have every $2 I’ve ever come across in an envelope somewhere. I like the idea of bringing people joy by using them. Thanks for the idea! Great idea J.$! I enjoy giving out silver dollars to people since I assume they think they are hard to find. They’re actually really easy to get. I just stop by the local Coins, Stamps, and Stuff and buy them for a little more that $1.00. Have you collected any error notes over the years? I don’t have an error notes, but I do have lots of old ones (like large US bills from early 1900s) and some star notes I’ve found in circulation. I know someone who found a bill that had two different serial numbers on it which is incredibly rare! The $2 prostitute is a prime example of being cheap, rather than frugal. okay – now THAT was good. I use $2 bills for Lunar New Year red envelope gifts but I failed to plan ahead this year and only had 2 left! So of course I didn’t want to give them away :D Totally silly but that’s what happens. 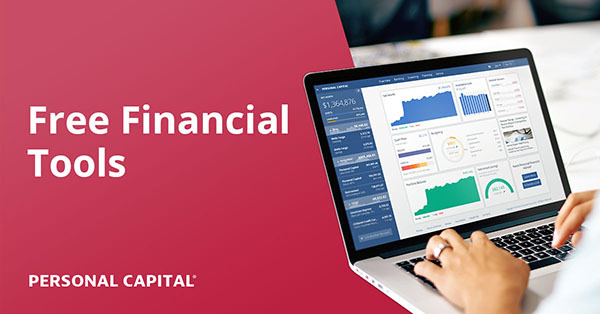 $2 bills are great to give as tips in any situation where you will be seeing the same servers regularly – think cruises or multi-day hotel stays. They are rare, so when you give them, you stick in the mind of the receiver. You’ll get good service from that person your whole trip! I actually use $2’s on a regular basis. For most every time I tip I use them and other times when I am using a small amount of cash. Pick them up from the credit union. It is fun to see the surprise people have in getting them but have never been questioned if they were real. Used a few this weekend betting on squares. Oh… and they are great to get girl scout cookies with too! I say make more $2 bills and ditch the penny! The cost to produce a $2 bill is 5.5 cents per note where the cost for a penny is 1.5 cents. I know people have done a thorough analysis on why we need the penny, but who cares about logic. The penny is stupid! I see no flaw with this plan! I haven’t seen a $2 bill since I was a kid. Then again, I hardly ever use cash. I had no idea the government still prints them! Are they bored or something? Have an excess of paper? I might have to get some to keep in my wallet so I can mess with my friends if I ever owe them money. Oh yeah, I have that $5 I owe you. Do you have change for $6? My dad loves to give me $20 in $2 bills whenever I see him and at Christmas. I love to use them at my favorite lunch spot because they love getting them and the meal only costs $4.50. I’m pretty sure I’m known as the $2 bill guy there. I find them really handy for buying snacks at gas stations, drug stores and grocery stores. I also love bringing only $2 to bars to buy cheap shots with. In may experience, 50% of the time bartenders refuse to let me spend the $2 bills and will give me the shots for free. They also give me a tip, I should stash it away for luck. On occasion I have been told a store won’t accept the $2 bill. It usually seems because they don’t believe it’s a real thing, but my dad thinks that it’s because they don’t have a spot in the register to put it. He enjoys watching them figure out where to put it or watching them reach in their pockets and throw two of there singles in the register and pocket it. Ooooh wow – I’m going to have to try that bar paying idea!! You know, as an “experiment” for this blog… Then if it fails I can just write it all off, right? 1. Daddy issues. I was taught to treasure these. 2. Tooth fairy. That and JFK half dollars. 3. Jefferson. Because even though he might not have been a complete eschelon of righteousness on slavery or debt, I love his ideas on revolution. 4. Your use of #alternativefacts. Haha yeah – for being a guy who talked about the importance of sound money management, he sure sucked at it huh? When I was a kid, my grandparents all started giving me $2 bills. It sort of just became a ‘thing’. I still have ’em. They’re great memories of a special thing done for me by special people. I love this post. I just rode my bike to the bank and bought me 24 of these little darlings! (They only charged me $2 a piece btw!) I then rode my bike where I learned I had a 90 cent late fee. So of course I pulled out my $2 bill to pay for it! The librarian said she had not seen one in years and promptly pulled out two one dollar bills of her own money so she could keep it. Smiles all around! (Did not bother to tell her that the bank had a sale on them at the moment and anybody could get them.) My bank said they could order them so I have 50 more on the way. Sometimes the simplest things are the most fun! BEAUTIFUL!!! Well done, my friend, well done. I’d take you up on the challenge, but then I wouldn’t earn credit card reward points on the purchase. How’s that for the best excuse ever? Better not be boo-ing at $0.04 in free money ;). Penniesanddollars, not just dollars! #allpenniesmatter! Haha… can’t argue with that. This entire blog post tickled me but I definitely want to get some $2 bills now. I’ll be at the bank soon. I actually got a stack of $2 bills for Christmas this year. In sequence. It was so absurd, I laughed. Probably my favorite present this year. Whoever gave it to you is a Master of presents. Cool timing indeed! It’s all a sign that you need to be using $2.00 bills now! Do it! DO IT!!!!!! 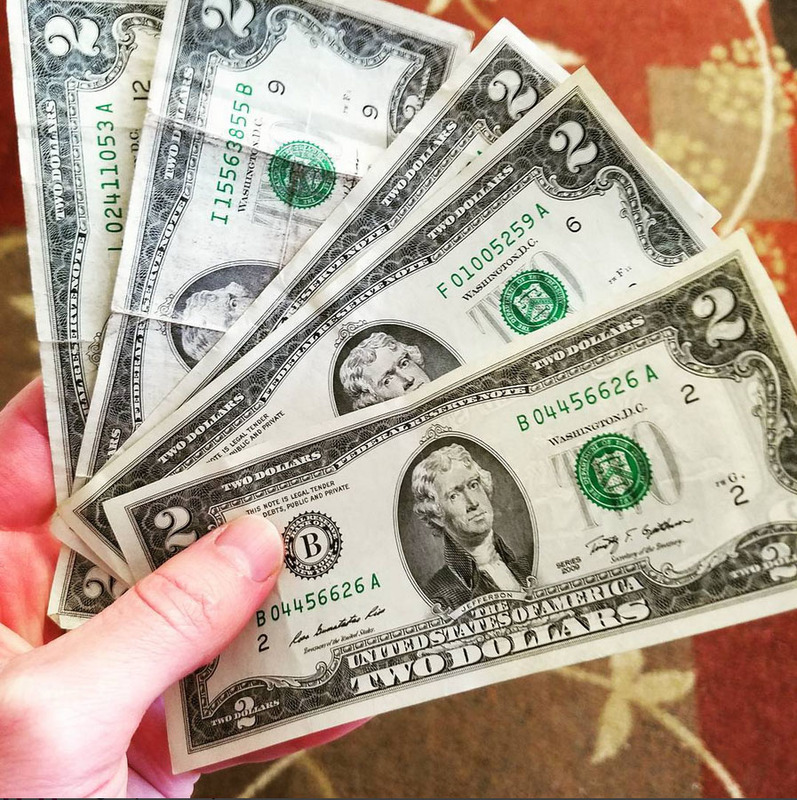 $2 Bills – they’re awesome! I have a whole stack of them and try to use a few at least once a month. They’re not the easiest to obtain though – I’m constantly bugging the tellers at my local financial institution about their $2 bill inventory. They probably think I’m some kind of weirdo always trading my $20s for $2s. Thanks for the great post! $2 McDonald’s item menu FTW! My hubby is obsessed with $2 bills. At one point I sent him to the bank to get some spending money for a trip and he came home with literally $250 in $2’s. I was furious! But in all honesty, we tip with them quite frequently. My hubby tries to use the $2 as a means to not have to tip so much because of the “joy factor”. I am a bit on the fence as to if its actually a frugal hack on his part or he’s just a cheapskate. Man, $2 bills make me think of my childhood. My grandma would give them as prizes to all of us for games around the holiday. I never spent them because it was something special my grandma gave me. I bet it would bring a smile to anyone’s face if you started circling them randomly again. Time to bring it back!! I still have a Canadian 2$ bill somewhere! Printing of the $2 note ceased on February 18, 1996 but I’m a persistent guy! My buddy managed a Wells Fargo and put in an order of 100 for me that I used as a prop at an accounting party (my friend got her CPA). People loved it and wanted to buy them off me. I used them for cash tips, coffee, etc for the following month. People loved it! I think the $2 bill spreads joy and we all need a but more of that! Great post!!! I am hoarding $80 worth of these $2 bills, and they are still in brand spanking new condition. We got them from the bank where my wife used to work. I’ve had it for at least 15 years now. I wonder if they have at least quadruple in value. LOL. We use them for tips overseas, no one there has ever seen them and it is a great conversation starter!! Just have to weigh in… Also a big fan of the 2! I’ve purchased bricks a couple of times over the years. Just go to the bank, tell them you’d like them to order a brick for you. When it comes, just withdraw $2,000 and they give you the brick. Even when you are used to 2s, having a brick of any denomination is probably fun.